I get asked all the time about gluten-free recipes. A few years ago, I wanted to develop a healthier cheesecake, one without cream cheese for Shavuos. That seemed to be the perfect opportunity to throw something gluten-free into the mix. Now don’t get me wrong; it’s plenty creamy and smooth… but lighter. With all the heavy and rich dairy dishes we have a tendency to eat over Yom Tov, it’s nice to have something that tastes delicious but isn’t so hard on the stomach. What I like about this recipe, as well, is the ingredients are simple, making it a nice dessert to prepare….and eat! If you make it, please come visit my website, Healthy Bitez Kosher, at www.healthybitezkosher.com and let me know how it turned out!!! Wishing you and your loved ones a beautiful, meaningful Shavuos! Enjoy! In a medium bowl or food processor, add all the ingredients. Mix or pulse until well combined. Press dough into a pie plate. Set aside. Put the cottage cheese and yogurt into a food processor or blender and mix until very smooth. Add the eggs, Truvia and vanilla. Make sure ingredients are well combined. Pour into the pie plate with the crust. Chill in refrigerator for at least 30 minutes. The cheesecake tastes best when it has sat out of the cold for about 10-15 minutes. I made this recipe last year as mini cheesecakes (with a chocolate ganache topping! Yum!) and they turned out great! Just use a 12-tin muffin pan instead of a pie plate. Line each muffin cup with a paper liner, then press about ½ tbsp. of the crust mixture into each one. Pour the filling on top. Bake at 350°F for 12 minutes. Cakes will be soft but firm. Let cool and refrigerate for at least 30 minutes. Coconut palm sugar (used for the crust) is a healthier sugar. It’s a little less sweet than refined sugar, but you can use it at a 1:1 ratio. It can be replaced with white or brown sugar in the same amount. For more information, visit www.heathybitezkosher.com/coconut-palm-sugar. Although I usually prefer using coconut palm sugar in most of my baking, I use Truvia for the filling in this particular recipe. Coconut palm sugar tends to give baked items a brownish tone. The cheesecake really needs to be white. The truvia baking mix does contain refined sugar, but since it is combined with stevia, it’s only half the normal amount. 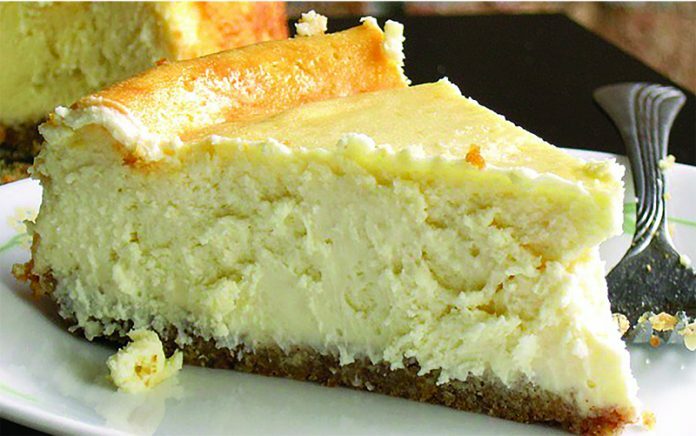 If you want to add a topping to the cheesecake, such as chocolate sauce or fruit, you MUST let the cake cool for a few hours. Otherwise, the filling won’t hold and the topping will mush into the cake.